You’ve been reading Monkey Pickles the past hour at work, ignoring the ringing of your desk phone and the boss shouting your name from down the hall. Just a routine day. Suddenly, in a rare moment of clarity that only happens every three or four months, you realize you’ve just spent an hour of your life with Monkey Pickles. You say to yourself “What was I thinking? It’s better than watching an hour of funny cat videos on YouTube. OK, it’s true that you might be in the majority of the population who pass the time at work watching cat videos. But, come on! How many cat videos can you possibly watch? The only explanation for people being mesmerized by an hour of cat videos is that there must be subliminal messages flashing on the screen. Messages like “You must watch ONE HOUR —> this cat video or cats will take over the world!” Cats are sneaky like that when they make their videos. Research has shown that there are no subversive messages shown on Monkey Pickles. In no way are you being coerced to read Monkey Pickles… Read Monkey Pickles… Read Monkey Pickles. Few activities will raise your IQ like Monkey Pickles. There are a gazillion self-help websites that you could spend your time reading. Learn how to build a yurt for shelter should you take a wrong turn driving to lunch and find yourself lost in a rainforest. Or learn how to make a bazillion dollars by publishing a book about how to make a bazillion dollars publishing a book. This is not the stuff to be putting into your head, and certainly won’t increase your IQ. Monkey Pickles will teach you about “5 Things You Shouldn’t Put in a Box”, “3 Reasons to Not Shave a Gorilla“, and the very useful “Top 10 Excuses for Not Having Your Homework Done”. These are valuable life lessons to learn and keep with you. When life throws you a curve, don’t duck. You’ll know how to deal with it from what you’ve learned on Monkey Pickles. You’re IQ will soar. Get ready for a knock on the door by the Nobel committee. You’ll never have to watch the Food Channel again. Admit it. When you’re home by yourself and no one else is looking, you participate in several indulgent hours of the Food Channel. Gourmet soups and casseroles. Rich cream sauces and desserts. Amazing looking main dishes with hard to say French names that translate into English as “meat on a plate with mushrooms”. And you won’t make a single one of those recipes yourself. Ever. Monkey Pickles to the rescue again. You will boost your culinary capabilities by reading “Turkey Sandwiches with Bacon“, “BLT Sandwiches Yummy” and the ever popular “Grilled Cheese on Wheat”. Get involved in the Monkey Pickles community and discover the Boss PBJ. Martha Stewart and Rachael Ray are no match for Monkey Pickles. Read it and dine well. The real reason for passing the time with Monkey Pickles. Those people who read Monkey Pickles will agree with every one of these points. But those aren’t the real reasons they read it. They read Monkey Pickles to be a more awesome human being. You can be one of those, too. 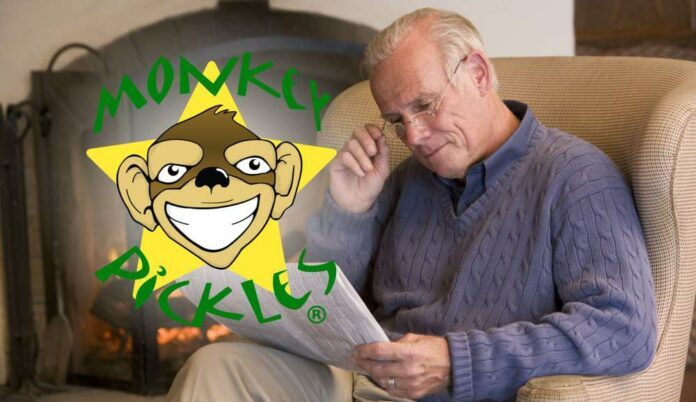 Put down that annual report or turn off the Food Channel and start reading Monkey Pickles. You can use a little more awesome in your life. Previous articleA Bunch Of Monkeys Go To A Rave. Who Has The Glow Sticks? What Should You Never Forget On A Vacation? What’s Something You Can Do Abnormally Well With Your Feet?